Dubai-based V.V. 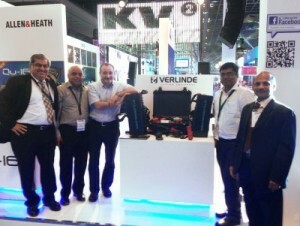 & Sons LLC will be an official distributor of Verlinde's Stagemaker brand of electric chain hoists for the entertainment industry and particularly the Stagemaker SR, the latest addition to the brand. "After several years of successful collaboration with TPC Group (Technical Part Centre) for our industrial chain hoists, we are now expanding our partnership with its subsidiary V.V. & Sons LLC, which is specialised in stage equipment. Our aim, naturally, is to expand our presence in theatres, TV studios, concert halls and other entertainment venues throughout the United Arab Emirates," says Verlinde marketing nanager, Jean-Yves Beaussart. In addition to the high reliability of the Stagemaker hoists, proven by the tens of thousands of models already in use around the world, the innovations of the Stagemaker SR model played a key part in the development of this new partnership. It is the only model on the market that is equipped as standard with a double lifting brake, custom CHAINFlux chain guide, patented Perfect Push load wheel, retractable handgrips and rubber bumpers. The Stagemaker SR also lends itself well to use in technical facilities of all types (climbing hoist or industrial-suspension hoist configuration) and offers the highest levels of safety and productivity.